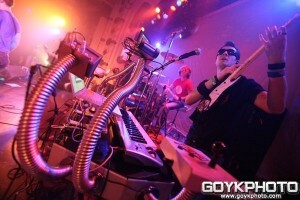 One of my first memories of Brian Mazzaferri is sitting with him and Todd Kessler at a Chicago music panel, hearing about his forthcoming chiptune-electro-pop project called I Fight Dragons, and thinking 1) that sounds really awesome, and 2) what the hell is “chiptune”. About 2 years later, I Fight Dragons (IFD) is signed to a subsidiary of Atlantic Records and on an MTV sponsored tour playing amphitheaters and arenas all on the power of their debut EP Cool is Just a Number. 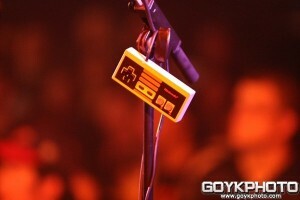 Turns out “chiptune” refers to 8-bit Nintendo-type digital music. There’s a whole scene build around this type of composition, but I Fight Dragons features chiptune as a supporting instrument, adding a hip yet familiar texture to their already brilliantly crafted, catchy-as-all-hell pop/rock. 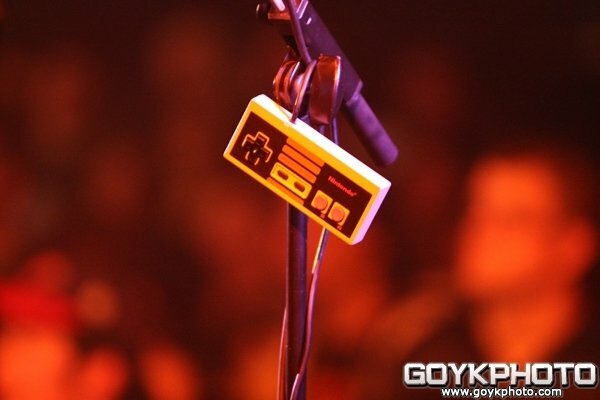 Plus, they pull it off live by playing midi controlled Guitar-Hero-guitars, NES and SNES controllers, Pre-DDR power pads, and even the classic Nintendo Power Glove. The strength of songwriting, harmonies, and proficiency at the “traditional” instruments of drums, guitar, and bass keep all this newfangled stuff out of the “gimmicky” realm and safely in the pocket of “awesomeness.” This band also happens to be composed of six cool, fun, and super-friendly people, so it’s been a pleasure watching their rocket-pack-powered ascent and getting to play with them a couple times along the way. The band granted me access to the secret headquarters at the tail end of rehearsal a few weeks ago as they prepared for the Too Fast for Love Tour with 3Oh!3 and Cobra Starship (making a stop in Seattle this week). I got a sneak preview of a brand new song and then sat down with the whole band to talk about their origins, finding a home in musical nerd-dom, and building international internet community around their music. Here are a couple text excerpts, and then the bulk of our conversation in short mp3 clips. Also, be sure to listen to the I Fight Dragons tunes on the Mid By Northwest Radio player! Outtakes and random funny bits for all you Dragon Fighters who can’t get enough IFD! Attention Seattleites! Catch I Fight Dragons this Wendesday (May 26) @ Showbox Sodo with 3Oh!3 and Cobra Starship! Click for more details. Plus, right now if you sign up to their email list at www.ifightdragons.com you can get a free 4 song EP with some sweet remixes and bonus tracks!